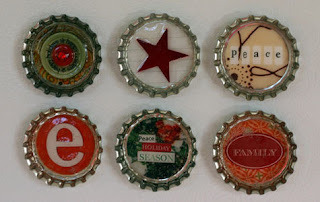 I have to show you a few pictures of what people can do with bottle caps. I have seen this idea floating around and everyone seems to credit someone else, so I'm not really sure who to give the credit to. 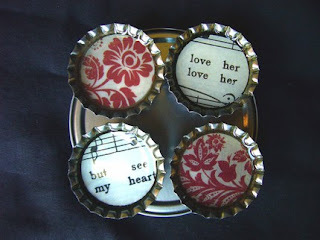 I found these pics on a blog called Whatever and she credits Ali Edwards. I've also seem them sold on Etsy. I happened to buy a bag of nicknacks at a garage sale that had a bunch of bottle caps in it. 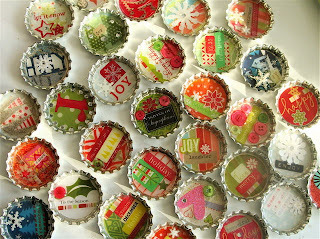 We are making a great big magnet board for the kids for Christmas, so I've been looking for some fun magnet ideas. Some of these pictures are of mega bottle caps that are 2''. I've never seen them in stores, but it seems like it would be a wee bit easier to embellish than the smaller ones. I decided to make some wooden flowers and stars to put mine on so they won't be a choking hazard for the babes. I used Mod Podge to glue the paper, but they used something called Glossy Accents. Aren't they fun?